PORT MORESBY, Papua New Guinea - The guided-missile destroyer USS Michael Murphy (DDG 112) arrived in Port Moresby, Oct. 6. 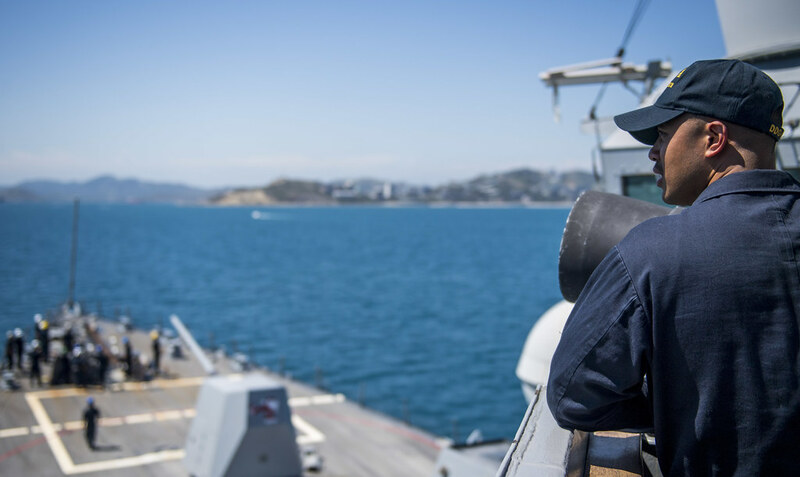 As the first U.S. Navy ship to visit Port Moresby since USS Comstock (LSD 45) in 2017, Michael Murphy arrives as the nation prepares to host the Asia-Pacific Economic Cooperation (APEC) Leaders’ Summit for the first time in November 2018. Port visits like this strengthen the U.S. Navy’s relationship with the maritime forces of Papua New Guinea. The port visit also follows Under Secretary of the Navy Thomas Modly’s recent trip to Port Moresby on Sept. 25, in which he met with senior military and civilian officials to discuss shared maritime security issues. While in port, the crew will conduct maritime training exercises, compete in sporting events, and participate in a ship rider agreement signing ceremony with the Papua New Guinea Defense Force. The ship rider program will provide PNGDF personnel opportunities to train with U.S. Navy Sailors while experiencing life aboard U.S. Navy ships. Lt. Dan Boring, Michael Murphy’s operations officer, said he was especially looking forward to the port visit because of his grandfather, Harold Boring, who served in Papua New Guinea in 1942 as a flamethrower operator in the Army National Guard and participated in the battle that would become the liberation of Papua New Guinea. Michael Murphy is forward-deployed to the U.S. 7th Fleet area of operations in support of security and stability in the Indo-Pacific region. The ship is named for Lt. (SEAL) Michael P. Murphy, a New York native, who was posthumously awarded the Medal of Honor for his heroic actions during Operation Red Wings in Afghanistan in 2005. Murphy was the first person to be awarded the medal for actions in Afghanistan and the first member of the U.S. Navy to receive the award since the Vietnam War. In September, Michael Murphy’s crew participated in exercise Kakadu, the Royal Australian Navy's premier exercise where regional nations conduct multinational maritime humanitarian assistance, search and rescue operations and high-end maritime warfare scenarios. The U.S. 7th Fleet is the largest of forward-deployed U.S. Fleets, with approximately 50 ships, 120 aircraft and 20,000 Sailors and Marines assigned at any given time.